Last August I took a business to Washington and squeezed in some sight seeing too. Only saw couple of museums since the time was short, so promised myslef to come back to washington and see the more. Last week had a chance to a take two day trip to washington, so I took it. This time I went to see the White House, Washington Monument, WWII memorial, Lincloln Memorial and Washington National Cathedral church. There is avery nice walk path where the visitors can walk from White House all the way to Lincoln Memorial with fountains and stream along way. Very nice. Lincoln memorial was very crowded for middle of week as there were many group of students visiting. It was not as big as I thought it would be, but being there where alot history had happend make it very special. 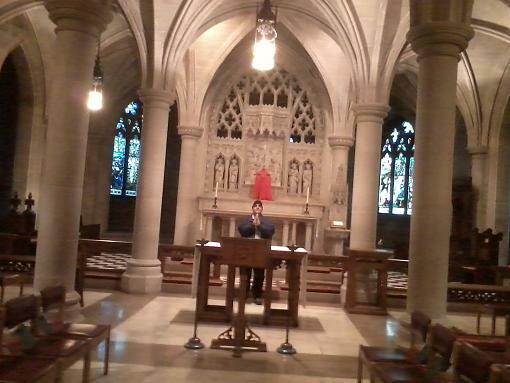 The morning before the flight, we squeezed in the tour of National Cathedral church and the builiding is amazing. It have old school middle ages feeling and still very functional as church as they were getting ready for easter service. This time instead of taking the cab, we took buses and subways. Washington must have one of best public transportion I seen. The buses on major routes run every 10 minutes, and combine with subway that run cross town, one could reach any part of town in less than1/2 hour. It's been almost 50 years since I last visited Washington, DC. I'd enjoy to visit again; I dare say lots has changed. I've never been to Washington but I'd love to go. Hubby and I came close to going once, but back then the exchange rate killed that trip and we ended up in Quebec City instead. That was 10 years ago...holy crap! It seems like just a couple of years. We just got back from Las Vegas last night. OMG! It was so nice to be in shorts and sandals, even if it was just for a couple of days. I have not been to Quebec City since 2005. Wow I miss the city. When we first went the summer of 1999 the exchange rate was incredible, well for us. Loved the first class car on Via Rail traveling from Quebec to Montreal. We loved jumping on the train for a day of shopping in Montreal. Smokey I can almost see the Halo. That is a beautiful church. Growing up Catholic I am used to ornate churches. 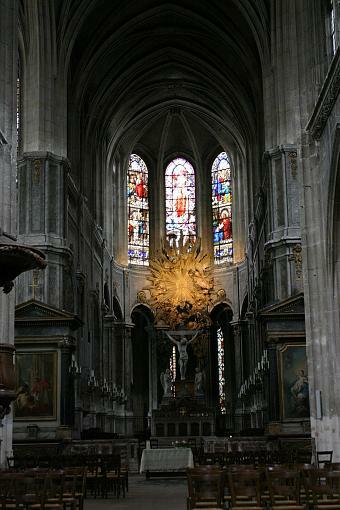 I would like to share one of the older churches I have been in when visiting Paris. I did not brave the lines for Notre Dame but this one is quite old. The walls both internally and externally are the blocks of stone with which they built the church. I find it very open and clean city. Ofcourse they keep telling me that I only been to the good part of town. It have alot of old buildings that date back to 1800s and history buffs probably love this place. I also enjoy the traveling part as much as being there. We flew over Chicago at night and looking down from airplane seeing all the lights was a sight to see. JohnMichael, your photo does not open up. Its probably my browser. Very little actually. Other than going to shows or some restaurants, we hate being indoors while we're there. So spending a warm sunny afternoon, or even a warm evening, inside a casino is not appealing. I'm surprised that none of the hotels have opened up an outdoor casino. That might get my attention. I agree. The view from an airplane can be very beautiful.